Meet Swifty, the newest member of our family. Swifty is a Logitech Guitar Hero Wireless Guitar Controller, a gift from Arrch when I was visiting Sydney! And named after Taylor Swift. 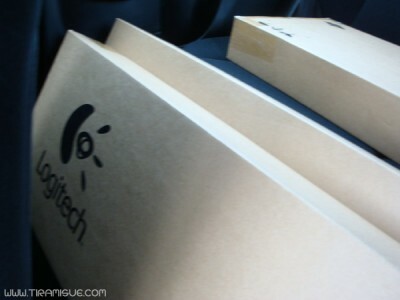 Three Logitech Guitars in Arrch's backseat! We got it just before I had to leave Sydney for Singapore, so I hardly had any time to get it ready for plane transport… Everything was still in the box! I wanted to carry it on with me, but they wouldn’t allow it because the box was too big. Eventually I stuffed it in a large Qantas see through bag and pasted huge red FRAGILE stickers all over the box while the baggage counter lady promised it would be hand loaded. All I could do after that was pray it would be fine. Memories of this song by a dude whose Taylor guitar was broken by United Airlines certainly didn’t help matters. 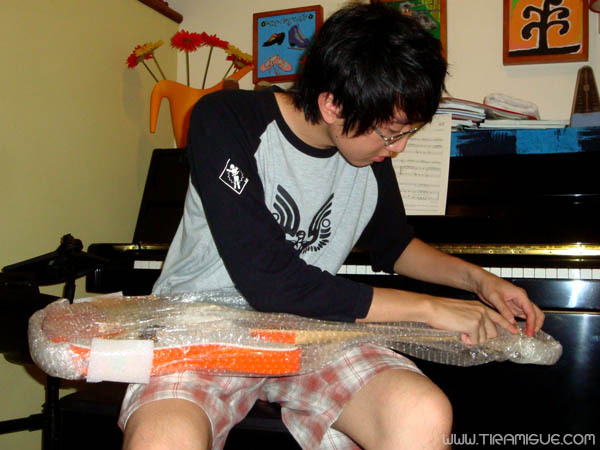 But eventually, my guitar did come out at Singapore Changi Airport fine and well. It was a huge box! No surprise I wasn't allowed to carry it in the cabin! I guess Qantas is a lot better than United. Heh. 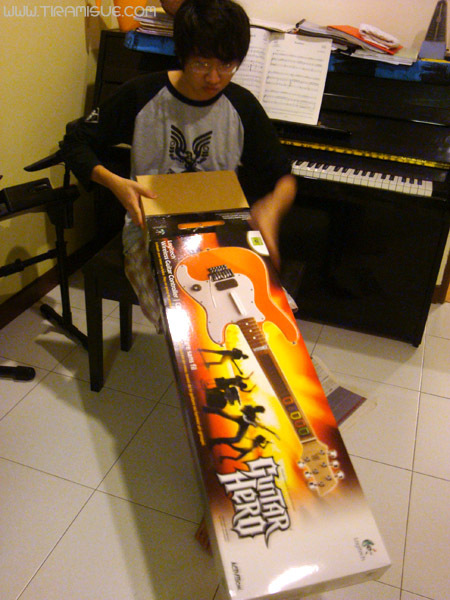 My brother unwraps my brand new spankin' guitar. Swifty’s just gorgeous. She looks and feels just like a real guitar. Her neck is real maplewood, her fingerboard rosewood, her frets, pegs, and tuning handles metal, and her body is solid! None of the gimicky plastic things we’ve been playing in the past. Size-wise, these guitars are the same size as a mini electric guitar, and they look very much like a mini Fender. Most of the electric guitar cases I found meant for full sized guitars, and just too big for Swifty. Mini electric guitars aren’t very common, so finding a case for that is pretty hard and may be pretty expensive too. Eventually I settled for a 3/4 acoustic guitar case, which fit perfectly. Now, the Lowdown on these Logitech guitars. 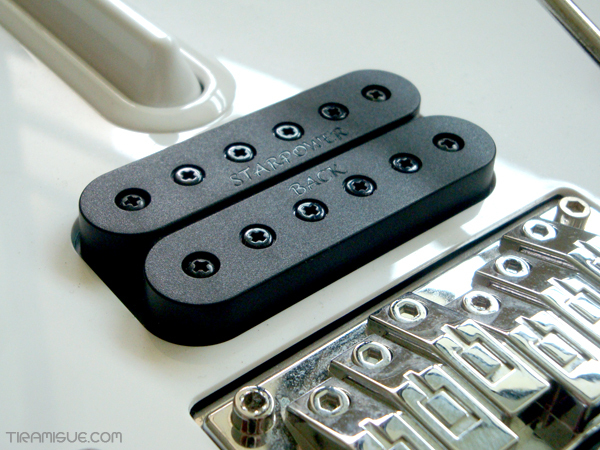 The strumbar’s nice and soft, no more of the clickety clicks we got from the old guitars. The weight is good. In fact the first thing everyone notices when they pick her up is that she’s really heavy! Like a real electric guitar would be. 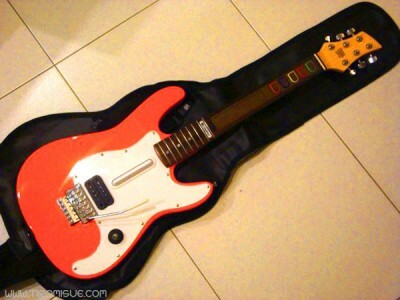 Of course, if you’re not used to playing real electric or bass guitars, the weight will give you a bit of a shoulder ache after a while, but it’s a good problem to have methinks. The bright orange finish. 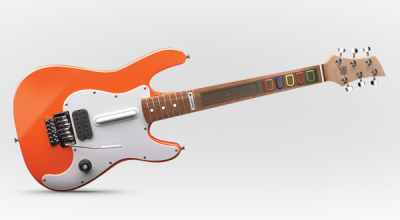 I have plans to further personalise this guitar, but a bright orange base just doesn’t cut it! Now why does the Xbox get bright orange when the PS3 and Wii get black and black/white finishes?! Not a fan of the orange. 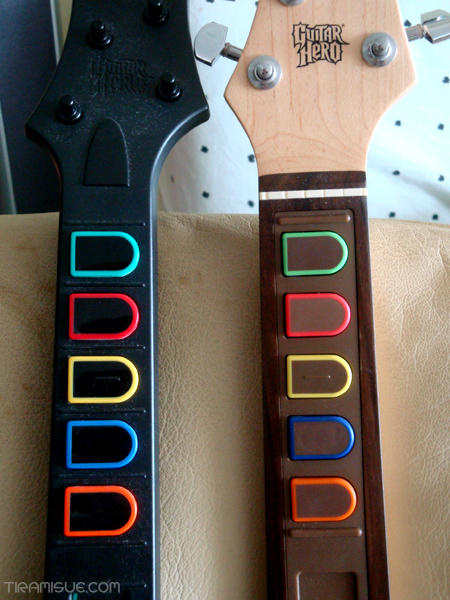 Next, the space in between each button is larger than those of the normal guitars. 8mm on Logitech vs 6.5mm on the original. Now 1.5mm may seem miniscule, but multiply that by 5 buttons and you’ll get 7.5 mm more that my fingers have to stretch. Makes it a bit tougher to play fast songs where you have to jump around the frets. Side by side, you can't tell the difference. Another issue I have is the Star Power button. On the old guitar it could be activated with a light tap. However, Logitech’s is very stiff and near impossible to press with the flat of your palm without losing your streak in a song. So essentially your only option to activate Star Power is to swing it the traditional way, and you might still lose your streak anyway because the Logitech guitar’s pretty heavy. Overall though, it’s still a pretty amazing replica and I’m thrilled to add it to my collection! I’m gonna embark on Project:Swifty soon, but more news on that later!